Gently spicy, subtly sweet, trickily tangy, clear soup consistency and a divine drink! You just can’t miss making this uber cool recipe that saves you, every time you are going through trying times, say when guests appear from nowhere taking you by surprise and shock, putting your culinary skills to test! What better way to greet them than with this health drink! Excellent source of Vitamin C and also in Vitamin B, raw mango, in dried powdered form (also known as Amchur), is helpful for treating scurvy. 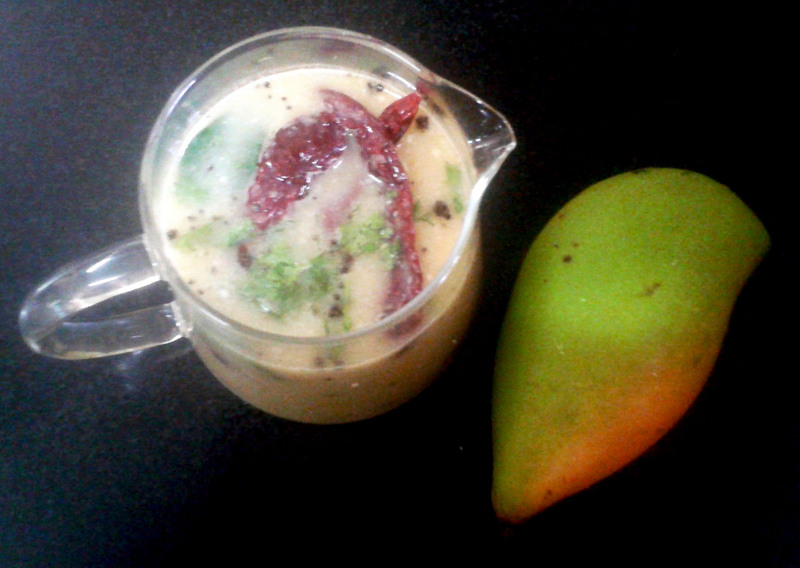 Raw Mango Soup is an ideal summer drink to combat negative effects of excessive heat. It prevents excessive loss of sodium chloride and iron that happens due to sweating. It is also known to cure blood disorders, increase body resistance etc. Eating raw mango with salt prevents dehydration. Curry leaves 3 or 4 nos. Wash raw mango thoroughly in water. Peel the skin. Grate and transfer to a vessel. Add salt, jaggery, turmeric powder and 100 ml. water to this and boil them together for about 5 min. till mango gets cooked properly. Let it cool. Store the boiled water that is settled on top to a vessel for later use. Dry fry pepper corns, cumin seeds and coriander seeds in a small skillet. Let it cool. Powder it in a mixie. To this add boiled and cooked raw mango. Grind them so as to blend the spices and mango. Transfer this ground mixture to the stored boiled water. Add more water (say 100 ml.) if required depending on the desired consistency. Boil once again for 3 to 4 min. Switch off the flame. Now is the time for seasoning. Heat oil in the same skillet. Add mustard seeds. When it crackles, add red chillies and curry leaves. Switch off the flame and immediately add asafoetida. Garnish with fresh, thoroughly washed and finely chopped coriander leaves. Spicy Mango Drink is now ready. Serve it hot or warm or cool. Any which way is fine.